Tomorrow is the first day of school for us here at the beach and with that I usually usher summer out and welcome the fall season with open arms. Fall is my favorite time of year and I love to squeeze in every possible minute I can to revel in its splendor. I love everything there is about fall and enjoy celebrating it in any way I can. I love the crispness that comes with the air, the falling leaves, the fall grasses and the early evenings. I love the bonfires, s'mores, and roasting hot dogs along with long walks along the beach and watchng the changing colors everywhere. 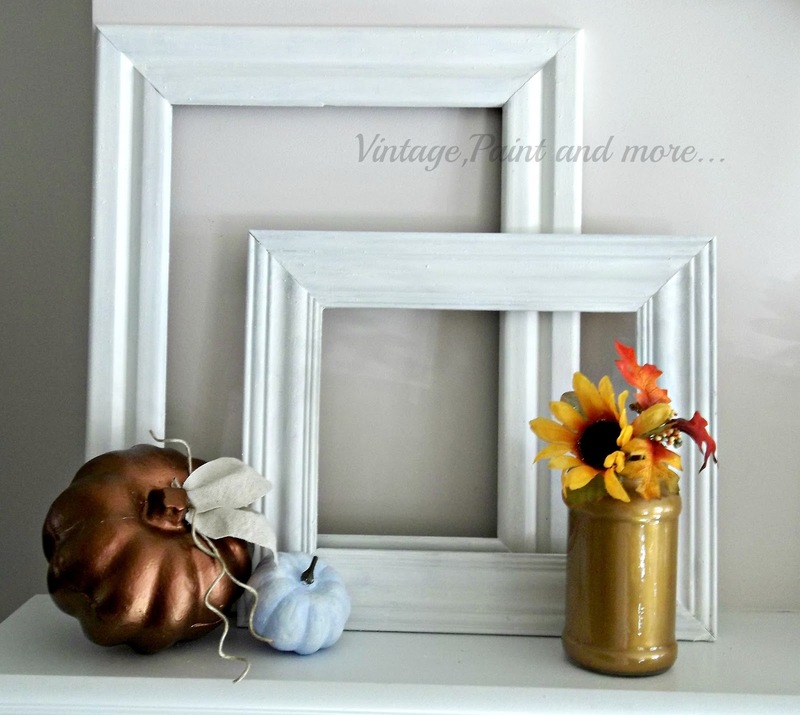 I have been thinking a bit about how I want to do my fall decor this year. Last year I went outside the box for us and although I liked it - the decor was not my favorite I have ever done. 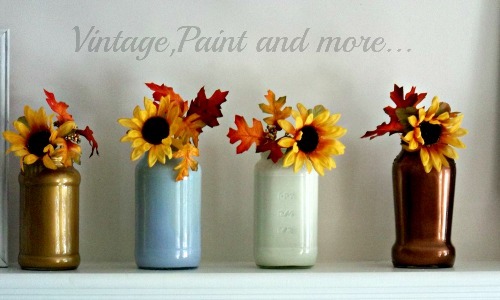 Since we use blue as the main color in our decor I wanted to incorporate it in our fall design as well. So I used the metallic colors - gold, copper and bronze along with pale grey blues and whites to make up our decor. 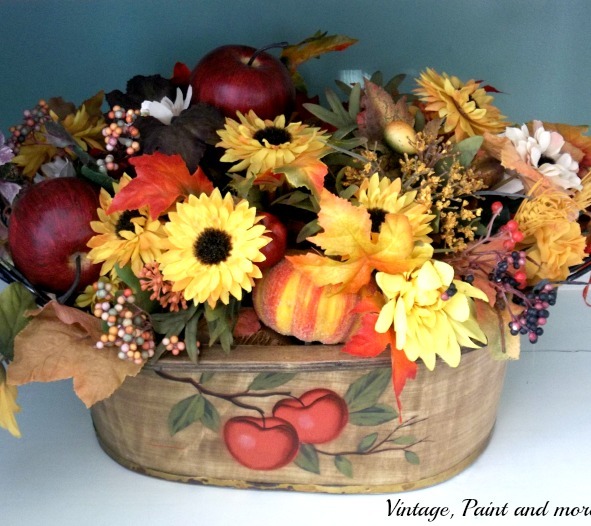 I loved it but I found I was really missing the bright yellows, oranges and maroons along with the browns of a typical fall palette. It was fun putting it together but, I think this year I am going to go back to the typical colors of fall. The brilliance of these colors are what fall is all about for me - so cheerful. So I think you will be seeing these colors in most of what I do. And I am also thinking that paper is going to be my main medium for working in this year. I love to work with paper and have a lot left from my scrapbook store so I am going to challenge myself to come up with a lot of paper decor to celebrate this fall. What do you think? Do you love the usual colors of fall or do you like to go outside the box with something unexpected? Have you ever challenged yourself to work in one medium and come up with new and different projects than your usual ones? I love to hear from you . Tell me about it in the comments below. I always answer all comments through email. I will be linking to the parties listed on my Where I Party page. So go check out these parties and see all the inspiration you can find there. How lovely! I can't believe summer is almost over, but fall is a beautiful season. I like the traditional colors and mix them with a bit of purple! Thanks for the great ideas! I do consider blue a fall color--the gorgeous blue of the sky in fall is very different than it is in the other seasons. That said, I totally understand! Hope everyone had a gread day at school today! I love your jars! I love blue also, and I use it a lot in my home, but there is something about those vibrant fall colors that just make me smile. I am very ready for them! Hi Cathy, I started decorating for Fall today. I am going with the basic colors of Fall,but a few vignettes have a touch of Aqua. Fall Harvest is my theme this year! I'm sure whatever you do it will be wonderful! You are so talented! Thanks for sharing with SYC. You chose beautiful colors - love the mix of light and metallics!